A plow. I keep seeing a plow when I think about the current sextile aspect between Saturn in Scorpio and Pluto in Capricorn. A plow cuts through soil, breaks open hard clods, turns over what has been hidden below the surface, and prepares the earth for new crops. A plow is an apt symbol for these two planets. Some real work is being done right now. It is time to turn over what needs airing in preparation for growth. Two planets in sextile aspect to each other are giving each other mutual support. This supportive relationship between Saturn and Pluto is a great boon to creating something sustainable and important. Both of these planets let us know what matters most and what is ultimately most satisfying if we agree to the missions they offer. Saturn in Scorpio’s mission is to reap the power of self-awareness through fearless internal exploration—to dive deep and then go deeper still. Pluto’s mission in Capricorn is to transform the consensual reality that gives culture its structures, meanings, and values—to be ready to let these structures die. Both of these planets urge us to turn over the topsoil and look deeper. Underneath, where we’ve either been too frightened or too complacent to look, we find potential. Pluto’s name means riches. Saturn’s name is derived from Latin meaning ‘to sow.’ Sounds fertile, doesn’t it? To continue the metaphor, someone’s hands need to be on the plow. Interestingly, Jupiter in Gemini fits this role perfectly. Jupiter amplifies the energy it contacts. Jupiter has been amplifying the active mind of the Magician, which has been seeking truth, honing tools, and shaping new perceptions this lunar cycle. Inside each of us is a Magician, a co-creator of the manifesting cosmos, who is doing this work with Jupiter. Gemini is a sign well-suited to magic. The sign of duality, trickery, and the mind is a much more light-hearted energy than either Capricorn or Scorpio. So, while Jupiter has been in aspect to both Saturn and Pluto, it has been inviting us to open into new perspective and to lighten up even as we realize the stakes couldn’t be higher. That Mayan calendar thing was a good chance to laugh at our tendency to project fear, while at the same time being compassionate about our concern for a world in jeopardy. “Wallowing in doomsday scenarios is not the solution,” says the Magician. Being quickly adaptable, having a sense of humor, and cultivating curiosity about everything gives us the tools we need to face reality (the domain of Saturn and Pluto). The week begins with the Moon still in the Full phase. Since the Magician is all about learning, use the illumination of this phase to become more aware of how every one of us matters in this work of plowing the fields of the future. The new year also begins this week. Even though the date of the new year seems somewhat arbitrary in the realm of astrological time, it is true that Capricorn, the sign where the Sun is on New Year’s Day, lends itself well to reflecting on the past and setting intention for the future—a good energy to begin a new cycle. What magical tools will you use for this work? Sunday, December 30. The Sun illuminates both Pluto and Saturn today and events may be significant. What are you learning about your self and others? We might be feeling extra sensitive with the Moon in Leo too. Sometimes Leo energy is playful and sometimes ultra sensitive to being appreciated by others. Notice what shows up for you. Take the time to affirm that in spite of doubts, you are essential to the great work of co-creation. Monday, December 31. New Year’s Eve. Mercury transits are important this week. Mercury rules Gemini, the sign of the Magician. This planet sometimes tricks us and sometimes entices us to learn about our own minds. Today, Mercury enters Capricorn. How will you develop authority in the ways you express yourself? While Mercury is in Capricorn (till January 19), get serious about honing skills of expression. Later tonight, Mercury contacts Neptune through a sextile. This aspect supports inspiration and contemplation. The Leo Moon tonight gives a tone of playfulness to New Year’s Eve gatherings. Mars and Uranus encourage conversation about changing the world. January 1—Disseminating Moon: Sharing. New Year’s Day. The holidays have a way of extending time. It might seem like a really long time ago when this lunar cycle began. ** But it has only been about two and a half weeks. On this first day of this new year, the Moon enters the Disseminating phase—the next stage after illumination. The feeling of getting back to routines and creating order in our lives is strong today. After an incredible experience of transformation during the first part of the cycle, we desire to make it apply to our everyday lives in a meaningful way. Yet, we are also being impacted by the cosmic ocean of Neptune and trickery of the Magician. An ideal approach may be to play and daydream while you clean house, make lists, and generally get yourself prepared for what is next. Wednesday, January 2. The day starts with a favorable connection between the Moon and Pluto and Saturn. The practical matters of life help us to anchor metaphysical realities. We know we are getting somewhere when we can take care of business while holding magical intention. We feel a strong desire to clean up our diets and get back to an exercise routine. Yield to that desire! Thursday, January 3. While the Moon is void-of-course for most of the day, there is space to enjoy ourselves if we don’t give into the anxiety of achieving perfection (always a concern under Virgo’s influence). The predominant aspect today is a square between Mercury and Uranus. When these two planets challenge each other, nerves can get frayed, unexpected setbacks can occur (much like a Mercury retrograde), yet we are also subject to brilliant insights. Adaptability, humor, and curiosity help us ride the waves. The evening is good for social events or experiencing the arts when the Moon enters Libra. January 4—Last Quarter Moon: Evaluating. When the Moon moves into this phase, we get a little critical. 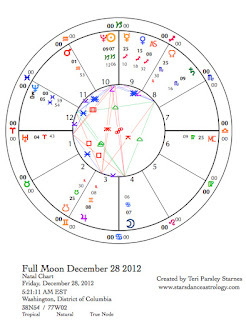 Early this morning, the Moon squares Uranus and later today squares Pluto too. Notice your impatience around things that are unsatisfying to you. Has change not reached deep enough for you? Have you been unsatisfied with your abilities to be a conscious co-creator? Do others annoy you or is it really yourself that you feel a slight disappointment in? This is all information, and is not the final analysis. We are evolving along with the world we are dreaming into existence. Mars trines Jupiter today and gives us a boost in positive thinking followed by positive action (and vice versa). Mercury sextiles Chiron today, too. We want our efforts to be for the healing and well-being of all. Saturday, January 5. Mercury joins in the planets of the Yod (involving Jupiter, Pluto, and Saturn) that has been in place this entire lunar cycle. Today Mercury forms a quincunx to Jupiter. (See the posts since the New Moon on December 13 to read about this Yod.) We have another opportunity to practice our Magician skills of pausing between stimulus and response in order to make a conscious choice about what we really want to do. The overall goal today is to create harmony. Our friends, family members, and loved ones can help us see new sides of ourselves and give us the impetus to create more peace in the world. The magic and wonder of the night sky takes my breath away. It is why I am an astrologer. I feel a connection to a long lineage of seekers and magicians when my spirit is lifted by the intelligence of the stars. Even in a week where so many are fearful that the stars portend an apocalypse, I know that really those stars are telling me to wake up, rather than fear, and be aware that this is not the end but the beginning. I am continuing my relationship with The Magician as the Moon waxes. My intention is to accept that I am a co-creator with an intelligent cosmos. ** I offer this quote from Richard Tarnas’s incredible book, Cosmos and Psyche as inspiration for what the Magician is doing: “His ultimate goal of knowledge is not increased mastery, prediction, and control but rather a more richly responsive and empowered participation in a co-creative unfolding of new realities.” This calls for deeper relationship. The wandering planets with the backdrop of fixed stars offer such a relationship. A little bit of astronomy will help us better appreciate the wonder of the night sky this week. Here is what you need to know. There are two ways to track the location of planets—sidereally and tropically. Sidereal means “with the stars.” Tropical means “with the seasons.” The scary-sounding astronomical concept to be aware of is “the precession of the equinoxes.” Look it up if you’ve never heard of this. Essentially this means that there are two zodiacs. Once upon a time the sidereal zodiac and the tropical zodiac were the same. So if you said, that the Sun was at 0 degrees Aries on the first day of Spring, that is where the Sun was in relation to the stars of Aries and that was where the Sun was when it crossed the Celestial Equator signaling the beginning of Spring. But due to the precession of the equinoxes, the tropical zodiac and the sidereal zodiac have separated. What this means to astrologers is that when a tropical astrologer (like me) says that Jupiter is at 9 degrees Gemini, it actually can be seen in the constellation of Taurus, conjunct Aldebaran, one of the four Persian Royal Stars. Some astrologers use the meaning of the fixed stars (like Aldebaran) along with the tropical zodiacal meaning (like Gemini) in their analysis of an astrological event. This week is a perfect opportunity to do that. Last week, I wrote about the Yod aspect formation involving Jupiter in Gemini, Pluto in Capricorn, and Saturn in Scorpio. I frame this configuration, which increases in potency this week, as the opportunity to become co-creators of new realities through the power of paradox. What do we dare to dream into reality? Jupiter will be at 9 degrees Gemini this week conjunct the fixed star Alderbaran. If Jupiter in Gemini represents the Magician, of all the places he could stand to do his magic, this is one of the most powerful ones. The ancient Persians recognized four Royal Stars in the four fixed signs of the zodiac. When Witches invoke the four guardians of the watchtowers of each direction, it is these four signs and these four stars that hold that power. Alderbaran is the Royal Star of the earth sign, Taurus. Even though, tropically Jupiter is in an air sign, Gemini, this earth power is also part of Jupiter’s placement at this degree. The power may be one of manifesting thought. How powerful our minds are! Another fixed star is prominent this week—Antares, the Royal Star of Scorpio, which is exactly opposite Alderbaran. Mercury and Venus stand next to Antares this week. Tropically, Antares is in the fire sign, Sagittarius. Just as Jupiter near Alderbaran combines the power of mind with manifestation, Mercury and Venus near Antares will unite the power of spirit (fire) with soul (water). December 16—Crescent Moon: Beginning One pitfall I easily fall into is mental overstimulation. As our intentions for this lunar cycle begin in earnest, it is important to mindful of the limitations of mind itself. The Moon in Aquarius encourages visionary thinking and can be very stimulating. How do you temper the Magician’s tool of mind in order to use this tool wisely? Venus and Neptune may play a role in helping to find the balance we need. Venus will be squaring Neptune today. Remembering to center our thoughts in our hearts is key to knowing how to use mental powers. We may be tempted to turn off spinning thoughts by escaping reality. A little of this can help, too much and we waste the opportunity to feel into our possibilities. Monday, December 17. Mercury conjoins the fixed star Antares and opposes Jupiter, which conjoins the fixed star Aldebaran. The desire to resolve dissonance is strong, yet may not be the best choice. Can you live with the questions without projecting blame? What happens when we let go of old paradigms? We are on the verge of new beginnings on so many levels. Is it possible to let go of one old assumption you have been holding for way too long? Does it feel like the world might end if you do? Well, it won’t. Try it. The evening* hours are especially powerful for experiences of transcendence. December 19—First Quarter Moon: Manifesting. On this third day of Moon in Pisces, it will be good to practice setting boundaries. If we’ve let this Piscean energy expand our hearts into greater and greater empathy, now is the time to know when to stop taking on more and more pain and develop the skill of knowing where to draw the boundary between self and others. Such boundaries help us maintain healthy compassion while at the same time not playing into scenarios of co-dependence. How does the Magician draw boundaries? Meeting this challenge helps us to manifest new patterns of in our relationships. From these new patterns, new possibilities arise. Uranus wants to help us in these new relationship patterns. Let your own authenticity guide you to knowing the borderline between you and others. Thursday, December 20. What if we were truly free? Free to feel with all our hearts the pain and bliss of the whole world and free to act effectively on behalf of the world we know we all deserve to live in? What if the only thing keeping us from that freedom is ourselves? This is not about blaming ourselves for not claiming this freedom, it is about honoring the great work of becoming the Magician who knows how to claim this freedom. The Moon in Aries gives us the drive to act, even when we don’t really know where those actions will lead. Today and the next two days are important as the Sun makes its standstill tomorrow on the Solstice. Aries is about beginnings, not endings. Envision the beginnings you plan to make. These choices are potent. One challenge today arises between the contradictions between effusive optimism and realistic fatalism. It isn’t about choosing between these options but using both to serve your intentions. Friday, December 21. Winter Solstice at 5:12 am. Honor all that you have learned on your journey toward enlightenment as well as all that you will never know. Remembering the quote from Richard Tarnas, the “ultimate goal of knowledge is not increased mastery, prediction, and control but rather a more richly responsive and empowered participation in a co-creative unfolding of new realities.” How are you becoming more richly responsive to the cosmos? How do you know that you make a difference? How do you honor the contributions of all? The Yod aspect pattern with Jupiter, Saturn, and Pluto is as exact as it gets today. Reach out to the mystery and claim your place in the unfolding new realities. Saturday, December 22. Tonight Venus conjoins fixed star Antares and opposes Jupiter, which is still next to fixed star Aldebaran. This has been a royal week of planetary gods standing at these two gateways in the sky. Jupiter is visible all night. Try to see Jupiter tonight as you invite in the balance between all the elemental tools of the Magician: the power of mind to manifest reality and the power of spirit to be tempered by soul. This path is not simple and every one of us will make mistakes along the way. With open hearts and questioning minds may we continue the grand quest of creating the world our descendants deserve to live in. Freedom, choice, magic, alignment. These are some of the guiding concepts for the next lunar cycle that begins on December 13 in Sagittarius. The glyph for Sagittarius is an arrow. It points to the horizon, a foreign and miraculous place where we hope to finally learn the meaning of our lives. This Mutable Fire sign searches for illumination. This pursuit of truth can sometimes lead to magic where we seek answers to questions like: What is the nature of the cosmos? How do we impact our world? What are the practices that help us to unify intention with manifestation? What is possible? How do I get there? The two quotes at the beginning of this article evoke magic. Thorn Coyle calls magic the marriage of breath, will, and desire that leads to the universe stepping forward to greet us. If we substituted “magic” for the words “human freedom” in the Rollo May quote another sense arises. A magician needs the capacity to pause between what happens to her and her responses to it. In that pause, magic is possible. I like the image of the Magician in the Rider Smith Tarot: He stands at a table with the elemental tools of his craft, with one hand holding a wand pointing above and the other empty hand pointing below. Those pointing hands remind me of the Sagittarian arrow, aiming and searching. This pose of the Magician tells us a lot about the nature of magic and the cosmos. As above, so below; as within, so without—the search and the answers are everywhere. Another Tarot card I want to pair with the Magician this lunar cycle is Temperance. This card actually stands for the sign of Sagittarius in the Golden Dawn system of correspondences. Of the many things this image evokes, the key concepts I’m drawn to are paradox, balance, and containment. With a magician’s skill to pause; reflect; and align breath, will, and desire we may be able to temper the truths found on the Sagittarian quest. To temper is to strengthen; paradoxically the path to strength may lead us through states of being that don’t feel very strong at all. Uncertainty may be a sign of getting somewhere. Confidence a sign we are missing something. Forecast for December 9, 2012 – December 15. December 9—Balsamic Moon: Surrendering. On November 13, the Scorpio lunar cycle began. The Balsamic phase of the Moon is the very last embers of a cycle’s intention. It is time to reflect on the experiences we’ve had this month. Scorpio drew me to the underworld. I followed an intention of feeding the unseen world below the surface. This work helped me to see important patterns in my life in a new way. I know myself better. I also come away with a stronger alliance to the unseen world. I honor the world that feeds my own. What have you experienced since the beginning of this lunar cycle? The Moon returns to Scorpio today, touching upon the emotional reservoir in our souls. As we reflect on this month, use your felt senses to take an inventory of what your soul needs in this moment. Venus arrives at 21 degrees Scorpio today, the same degree as the Solar Eclipse New Moon on November 13. This goddess of harmony helps us to resolve conflict or tension that may have simmered under the surface all month. Monday, December 10. Saturn and Pluto have formed a coalition of the forces for transformation and accountability. Combined they are incredibly powerful. Great satisfaction is possible when we see things for how they really are even when they aren’t pretty. The amount we are able to manifest our heart’s desires may be in direct proportion to how willing we are to uncover parts of ourselves we were afraid to expose. The beautiful thing about this coalition is that it doesn’t have to be an unpleasant experience. We feel good when we look deeper. The Moon supports this coalition today and we learn more about the value of the unseen world. Tuesday, December 11. For the third time since October 29 Mercury squares Neptune early this morning. * This aspect may be the defining one from Mercury during its recent retrograde cycle. My friend, astrologer Heather Roan Robbins, wrote about the devastating effects of superstorm Sandy (which hit New Jersey on October 29) in terms of how disrupting to communication and travel (Mercury realms) this storm from the ocean (Neptune realm) was. Transits happen this way: literally and metaphorically. Mercury had a powerful retrograde cycle this time. Today, we may notice some stormy effects from Neptune on communication or thoughts. However we may also be visited by important dreams this morning. The message may be about how our fates are entwined. With the Moon’s entry into Sagittarius we notice a shift in our gaze. From deep inner worlds, we turn our attention to the distant horizon. However, since we are near the end of the lunar cycle, it may be best to travel through the inner terrain of possibility before setting out on an adventure. New intentions are brewing. Wednesday, December 12. The energy of the Moon in Sagittarius continues today but it may be harder to stay focused on the inner journey. An opposition between the Moon and Jupiter in Gemini kicks off a predominant theme of the next lunar cycle. Notice the interplay between Temperance and the Magician (See the introduction to this article.) As Magicians we need to cultivate the tools that help us to stay centered in the midst of so many possibilities. Events today could be very informative concerning development of your magical tools. What do you need to invoke in your life to be able to pause between stimulus and response? 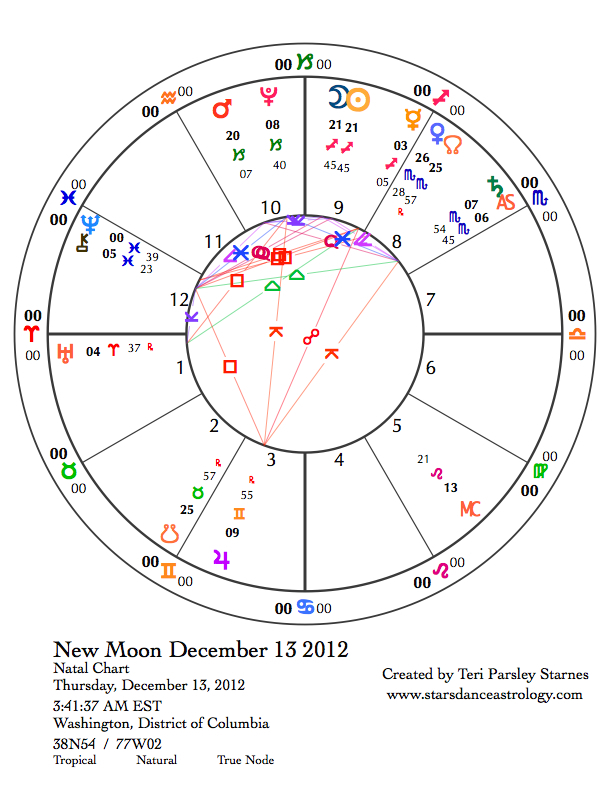 December 13—New Moon: Dreaming. The dark of the Moon in the darkest time of the year is a potent time to dream of the world we wish to co-create. If we can’t dream it, how can we expect to manifest it? This dream is the reason to invoke the Magician in ourselves. This dream is the reason we apply ourselves to the Great Work of self-awareness and potency. Give yourself over to dreaming. 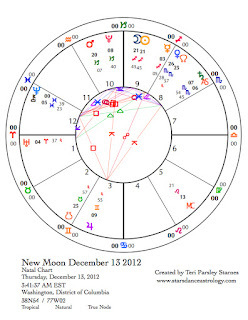 The chart for the New Moon shows an aspect configuration called a Yod. A Yod is a triangle, which for me has the energy of paradox and dissonance. Yod is a Hebrew term which means finger of God, so there is a sense that this moment is portentous, a moment in destiny. The planets in this Yod have been in this aspect with each other since late November and will continue in this relationship with each other until the first week in January. The configuration will peak at the Winter Solstice on December 21, and so influences any magic we may want to do at that time too. In brief, the quality of this Yod represents a paradox. The strong coalition of Pluto and Saturn, geared toward transformation and accountability, must contend with Jupiter in Gemini, an energy that gets distracted easily but can also be brilliant. Saturn and Pluto represent slow processes of evolution and manifestation. Jupiter in Gemini represents the lightening bolt of inspiration. How do we bottle that inspiration and tether it to the real world? It will take the tempered skill of the Magician. Another archetype, the Shaman, plays a role in this lunar cycle. Chiron leads us through shamanic initiation. We straddle the divide between our own wounds and the call to being a healer for others. Chiron is square to a significant opposition between Jupiter and Mercury who are in mutual reception to each other also. A mutual reception means that two planets are in the signs that the other rules. [Mercury rules Gemini and Jupiter rules Sagittarius.] The dream, the reason to invoke the Magician, is influenced by a strong need for healing in all the realms. The Magician and the Shaman are guides into the dreamtime of Winter. I know that I have readers in the southern hemisphere as well, where you are experiencing Summer. Even though the seasons are radically different from each other, the intention applies. The Sun, at its peak in the southern hemisphere adds energy and light to the dreaming work of the dark we do in the north. More and more we will be thinking globally as we do our seasonal work. This is also part of the Dream. Friday, December 14. Yesterday, Mercury reached the degree where is last stationed retrograde. Mental function is stimulated and seems to be moving along quickly, especially after the potent New Moon energy. Remember the practice of pausing between stimulus and response. What clear choices do you have? The mental energy will be in contrast to a desire to be grounded, productive, and responsible. Saturday, December 15. It is possible to be careful and accountable at the same time as we push against the confinement of obligations and traditions. But it isn’t easy. We want to break free today. Venus enters freedom-loving Sagittarius. The Moon is in visionary Aquarius. Loosen the reins to see how that serves the evolving Magician in you. You can run but you can’t hide. Does it ever seem like no matter how much intention and conscious choice you practice in your life, the unexpected still catches you off guard? Well, for me, that happens a lot. This week is a good time to notice how we’ve been hiding and what we might really like to run away from. This might sound dire. It isn’t. The transits this week are not calamitous. Rather, I think they will encourage us to rethink and restart some things. We’ll have an opportunity to take a big picture view of where we’ve been the last few months and how all this might relate back to the New Moon intention set around November 13 when this lunar cycle began. We are in the waning phase of the Moon now. Moon wisdom says that this is a better time to evaluate and wrap up things than a time to embark on new projects. I’m not so strict as that, but I do think we can use the waning energy of the Moon to look at where we’ve been and what we’ve learned. And if you really want to begin a new project, let those experiences inform you. Mercury turned direct last week, so it is catching up to the place where it stationed retrograde on November 6. This last phase of Mercury’s retrograde cycle can catch us off guard by unexpectedly asking us to go back and fix something we thought was over. December 13, Mercury returns to the degree where it stationed and we’ll be cruising full steam ahead. Until then, pay attention to what you assumed to be working well, especially in the area of communication, and why you are finding out now that it wasn’t. Mercury has spent most of this retrograde in the sign of Scorpio, so confusion and misunderstandings can possibly trigger deep feelings we didn’t even know were there. We can’t hide from the hidden world for long, even if we want to run away at top speed. Give yourself the gift of looking within. As the holiday season gets underway, remember that the hidden world is feeding us. How are you returning the gift? 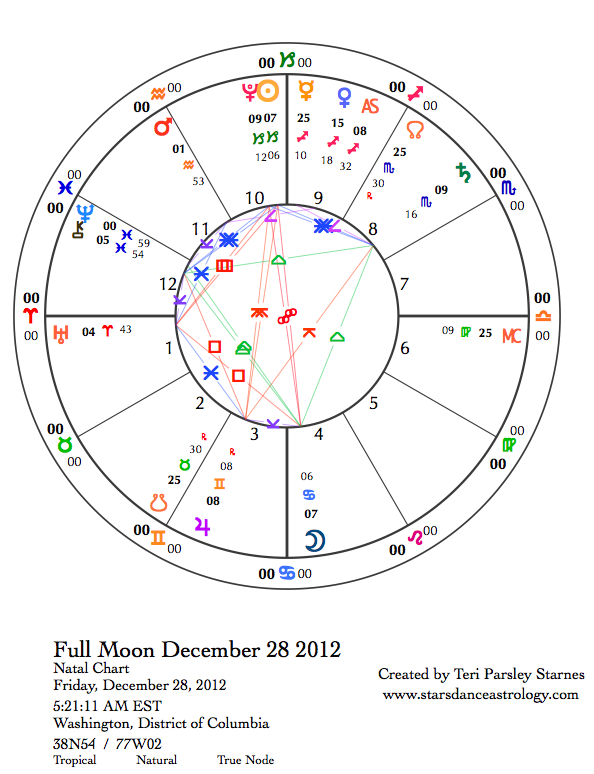 December 2—Disseminating Moon: Sharing. For the past few weeks, there’s been a great emphasis on the energy of Scorpio: Saturn’s ingress into that sign on Oct. 5, a New Moon Solar Eclipse on Nov. 13, a Mercury retrograde cycle predominantly in Scorpio, and Venus’ entry into Scorpio on Nov 21. By now, we are well aware of all kinds of subterranean places within our personal and collective psyches. However, there is an upperworld too—a place of ideas, beliefs, and interactions with others. The upperworld asks us to pay attention to what is going on around us, not just within us. We are being stretched to hold as much of both of these worlds as we can. In and out, deep and surface, below and above. Jupiter in Gemini, reminding us of the importance of the upperworld, is taking center stage right now and will be a large influence on us for the next few weeks. Until Jan. 6, 2013, Jupiter is at the apex of a Yod aspect configuration with Saturn sextile to Pluto forming the base of the triangle. The promise of a Yod is new understanding through paradox. The promise of Pluto and Saturn, helping to uncover and enrich the hidden world, is paradoxically realized when we learn how to use the Jupiter in Gemini energy well. Jupiter is the planet of expansion, belief, and meaning. I feel the energy of this planet like a wind filling my sails. This feeling is especially true with Jupiter in the mutable air sign, Gemini. Jupiter stays in a sign for about a year. It entered Gemini in June of 2012 and will leave in June of 2013. Right now, Jupiter is moving retrograde, so we get to retrace the initial impact of Jupiter in Gemini. It is a time to become more aware of this influence. What is Jupiter teaching? And what does this have to do with the hidden world? The Magician is an appropriate archetype for Gemini. The ruler of Gemini is Mercury, the trickster magician. The dual nature of Gemini forces us to see our own dualities, the ways we project, the ways we blame, the ways we trick ourselves out of knowing the truth right before our eyes. Yet, Gemini also represents the ways we reach out to others to integrate what is missing in our lives. We seek connection and wholeness. This is the promise of Gemini. Today, as the Moon moves into the Sharing phase of its cycle, the Sun is exactly opposite Jupiter. The Sun helps us to bring things into consciousness. What are you realizing about the connection between the upperworld and underworld? How are you a Magician in the synthesis of these worlds? What missing piece are you reaching out to integrate? These questions apply to this day, but will serve as long as Jupiter is in the Yod formation with Saturn and Pluto. This Yod will impact our relationships and communications with others. Be careful with hasty decisions and reactions. How would the Magician handle the situation? Monday, December 3. Jupiter is the star of the week, but Mercury will bring the messages. Today, Mercury is at the degree of the previous Solar Eclipse of Nov. 13 for the third time. Tranisting planets can trigger an eclipse events even after the eclipse is over. If 21 degrees of Scorpio is significant in your chart, you may be having a particularly trying time since Mercury has triggered this degree three times. Today is the final one. As a note: Israel’s national chart has Chiron at this degree. Perhaps what is playing out in that country will reach another crisis today? We can hope for resolution but wounds are hard to transform. Tuesday, December 4. Today, Mercury is at its greatest elongation from the Sun in the morning sky after its recent retrograde journey. I expect some big “ahas” today. The Moon in Leo is square to Mercury too, increasing the possibility of disruption in how we want things to go. Use the Leo Moon to adopt a playful attitude. Wednesday, December 5. Housekeeping time! The Moon moves into Virgo, the other Mercury-ruled sign. If you are experiencing a little too much chaos, or intrusions of upper and lower worlds, find time to bring a little more order into your life. It is amazing how even something like sweeping the floors helps to move energy out of the house, creating more space to deal with things. You might also want to start your holiday list making today. Be discerning. Do only what is necessary and gives joy. December 6—Last Quarter Moon: Evaluating. The Moon is still in Virgo and we need to be alert to an overly aggressive evaluation of ourselves and others during this phase of the Moon. I really appreciate how Virgo strives for excellence but sometimes this desire goes too far into a shame-inducing perfectionism. Notice that urge and see if you can shift back into positive ways to create more order and affirmation in your life. Dealing with the hidden world, as we have during this lunar cycle, we need to forgive ourselves when we see things that we wished we hadn’t uncovered. Be brave and self-loving. Friday, December 7. Another tweak from Mercury today as it reaches the same degree of its past inferior conjunction with the Sun. That happened on Nov. 17. We are being gently reminded that the hidden world still feeds ours and that the relationship between these worlds is rich and rewarding. The Moon in Libra opposing Uranus encourages us to tip the scales into action. Small, personal acts of beauty and balance can create a force for larger change. Saturday, December 8. This is a great day to take in the arts. The Moon in Libra encourages us to revel in the beauty around us. And if you can share that beauty with a significant other in your life, even better. With a square between the Moon and Mars, we may notice conflict too but that doesn’t have to stop us from appreciating those important people in our lives. Passion can move us closer.